After running SharePoint Server 2010 setup.exe, Setup Errors occur. This product requires the Windows Identity Foundation. This product requires Microsoft Sync Framework Runtime v1.0 (x64). This product requires Microsoft SQL Server 2008 Native Client. 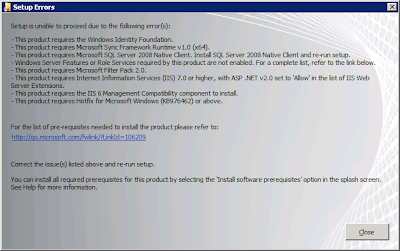 Install SQL Server 2008 Native Client and re-run setup. Windows Server Features or Role Services required by this product are not enabled. For a complete list, refer to the link below. This product requires Microsoft Filter Pack 2.0. This product requires Internet Information Services (IIS) 7.0 or higher, with ASP.NET v2.0 set to 'Allow' in the list of IIS Web Server Extensions. This product requires the IIS 6 Management Compatibility component to install. This product requires Hotfix for Microsoft Windows (KB976462) or above. 6. Internet Information Services (IIS) 7.0 or higher, with ASP.NET v2.0 set to 'Allow' in the list of IIS Web Server Extensions. iii. Confirm that ASP.NET V2.0 is set to "Allow"
7. Hotfix for Microsoft Windows (KB976462) or above. Microsoft TechNet (July, 2010). Hardware and software requirements (SharePoint Server 2010). Retrieved January 20, 2011 from http://technet.microsoft.com/en-us/library/cc262485.aspx.